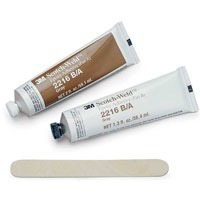 Cyanoacrylate adhesives have been on the market since 1958. Most industrial or household grade cyanoacrylate is made of shorter alkyl chain derivatives such as methyl or ethyl cyanoacrylate (WPI #7341 and #7342). They are very useful for temporarily holding tissues such as mounting specimens for microtome sectioning. Cyanoacrylates Not Suitable for Live Animals Historically, cyanoacrylates have not been suitable for bonding wounds on live animals. The difficulties of using cyanoacrylate for bonding live animals include: a strong, irritating odor quick loss of bonding strength due to breakdown of the bonding by hydration the breakdown products (cyanoacetate and formaldehyde) are toxic and can cause inflammatory reactions they have low flexibility and tend to be brittle Butyl Cyanoacrylate Better for Surgical Applications To overcome these issues, several longer alkyl chain cyanoacrylates were developed especially for veterinary and human use. The first longer alkyl chain product is butyl cyanoacrylate. Butyl cyanoacrylate has been used for animal and human applications outside the USA since 1970. It is much less toxic and has a lower odor than the methyl and ethyl cyanoacrylates. 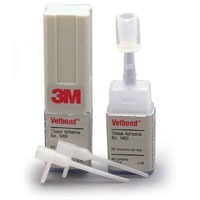 Our VetBond is a butyl cyanoacrylate. New Octyl Cyanoacrylates are Even Better A family of adhesives containing octyl cyanoacrylate, a plasticizer and stabilizer, was developed In the 1990's (one of them approved by FDA for human use). When bonding to tissue, these new adhesives are four times stronger and less toxic than butyl cyanoacrylate. Compared with the traditional suture, the new super adhesive has several advantages. On average, it takes only one-tenth of the time to close an incision. The bonding strength is equal to 5-0 monofilament suture. It has a mysterious antimicrobial effect that can decrease infection rates in contaminated wounds. Bonding will slough off naturally in 5 to 7 days. Cosmetic appearance of the healed incision is also better. Gluture Topical Tissue Adhesive (WPI #503763), WPI's octyl cyanoacrylate, forms a strong and flexible film. 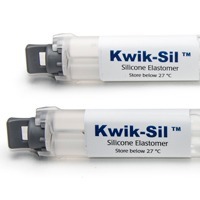 This makes it more suitable for surface wound bonding, protection and holding a sensor or other device on the tissue. Setting time is about 10 seconds, which gives ample time for application, It can also be used for temporarily holding live tissue. For example, there is a report of using it to hold nematodes on a glass slide for patch clamp neuron recording. 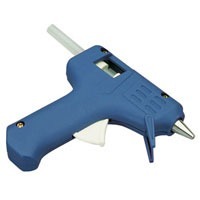 Our miniature glue gun comes with three sticks of specially formulated hot melt glue for use in a research laboratory.